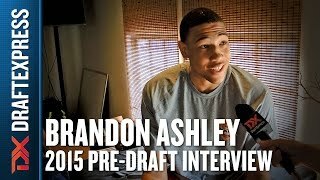 One of the biggest disappointments at this event relative to his talent level and the accolades that have followed him in his career thus far, Brandon Ashley struggled to establish himself in any way, shape or form throughout the week and was unsurprisingly part of the first round of roster cuts. 6-8, very smooth, and very much looking the part of a major prospect on first glance, Ashley has done little to improve his frame since the first time we saw him a few years back, leaving many question marks regarding how much time he's spent in the weight room. Not quite strong, aggressive or tough enough to bang with the other post players down low, but not skilled enough to spend as much time on the perimeter as he seems fond of, Ashley is very much stuck in between positions at the moment. He can make an occasional jump-shot with his feet set, but is just an average ball-handler, having a difficult time finishing around the basket through contact. Defensively, he lacks intensity in a major way and regularly had rebounds taken away from him in traffic, not being helped by his short wingspan and underdeveloped frame. Ashely is in the right place at Arizona under Sean MIller to try and overcome his shortcomings and still make the most of his considerable talent-level, but he will have to show a better motor and apply himself more consistently on both ends of the floor if he's to reach his potential. Getting cut may have been a blessing in disguise for him, as he clearly has a lot of work ahead of him.